As we have recently seen an amazing and unexpected price concession for Galaxy S6 and its other variants.Another price cut for some of the high-end Samsung phones before that was also most festive. Today Samsung has announced a price cut of Rs: 5,000 (50 US $) for Galaxy Note5, the flagship model of its hot famous Galaxy Note series. Yes, Galaxy Note5 is now available for only on 77,500 Rupees in Pakistani market with a warranty and insurance of 1 complete year. Whenever a new Samsung phone comes in market, it is available in two options. One, with the warranty of some official distributor in Pakistan, and other without warranty. The without warranty phone is actually imported by some private vendors in Pakistan from international market. The phone which are available with warranty are brought into Pakistan by some business agreement between the official distributor and Samsung. So, there will is a difference of Rs: 10,000 between the both sets in pin-pack condition. If you buy a phone with warranty, you will have to pay Rs: 10,000 more and if you buy a pin-pack phone without warranty, you save Rs: 10,000. 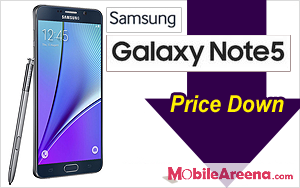 This price cut is for the Samsung Galaxy Note5 with warranty. So at the same time this phone without warranty is available in market for Rs: 67,500 rupees these days. You have another option to save your Rs:10,000 and some extra if you buy this phone with warranty of 10 to 11 month in used condition. 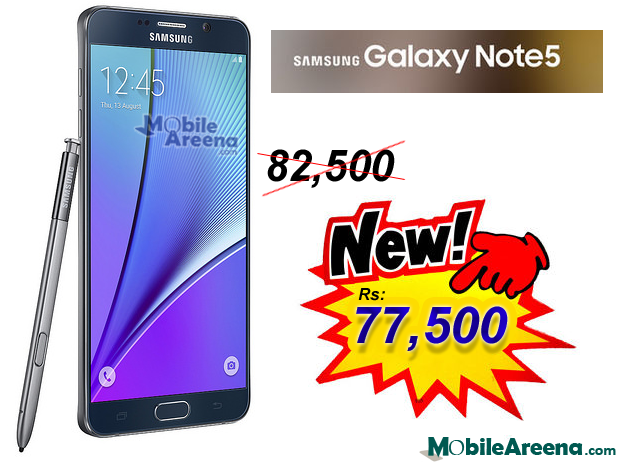 Because unboxing of any of the high-end device like Samsung Galaxy Note5 is worth of minimum Rs: 10,000 (100 US $).